Flaky, sweet, creamy, and addictive this pastelitos de guayaba is the perfect Cuban dessert to have on a Sunday morning with a cup of Cuban coffee. Te amo papa! This recipe makes me emotional. It brings me back to a time when I was carefree, careless, and cared for. To the kitchen where love was freely shown. Where my papi would walk in with bags from the bodega filled with treats that remind him of his hometown Artemisa in Cuba. This recipe connects me through the miles to my father. Guava and cheese. Love and liberty. Home and hope. We typically attribute a smell or a taste to a memory. For me, guava and cheese will always remind me of my father’s love. I am loved. Cuban food was his love language to us. For this, I will forever write and share my love for the Cuban cuisine. 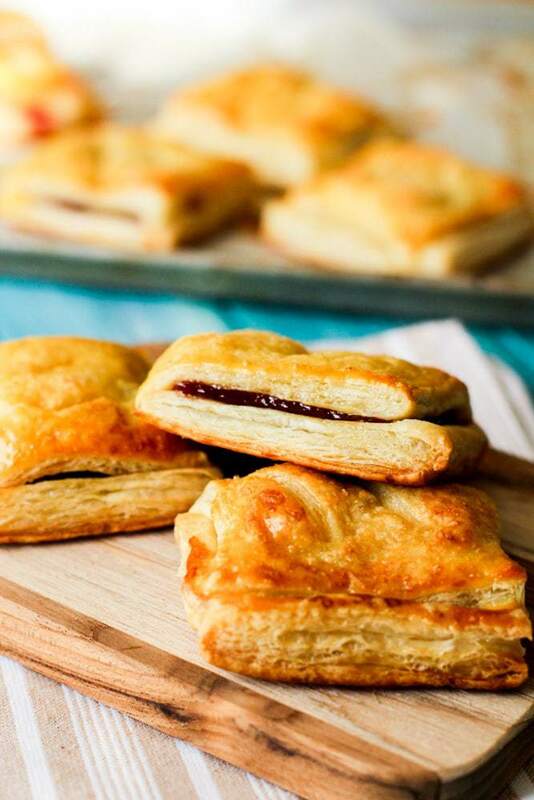 For this pastelitos de guayaba recipe, we’re going to be making this Cuban guava pastry with store bought puff pastry. 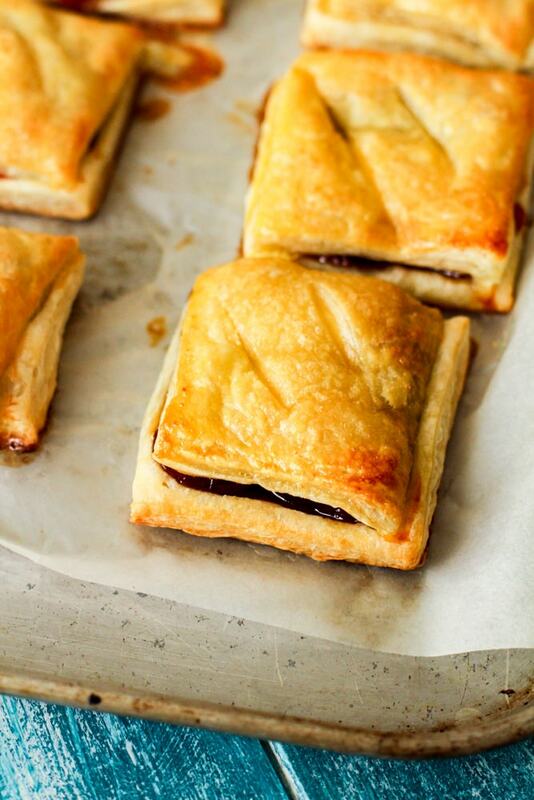 Using puff pastry that is already made saves so much time in the kitchen and allows you to stuff your face quicker with this guava filled delight! This recipe takes only 4 ingredients. Yes, only four ingredients to make this pastelitos de guayaba. 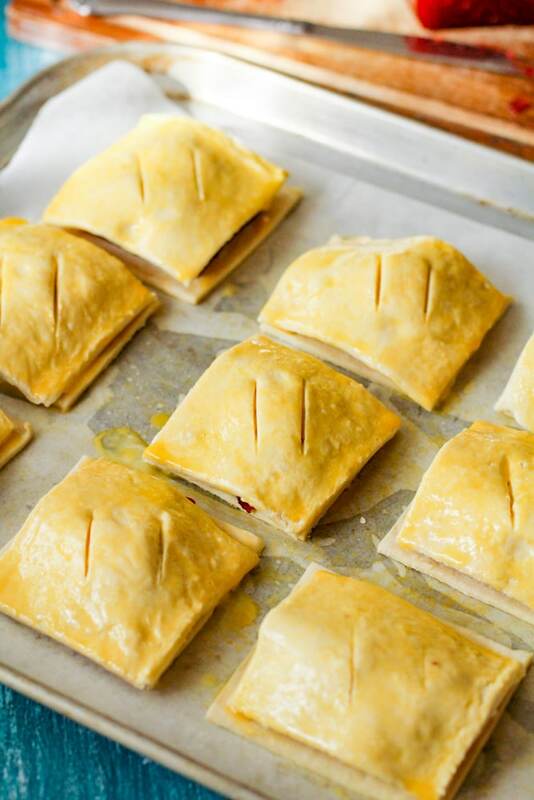 Allow your puff pastry to thaw on the counter for about 20 minutes before assembling your pastelitos de guayaba. 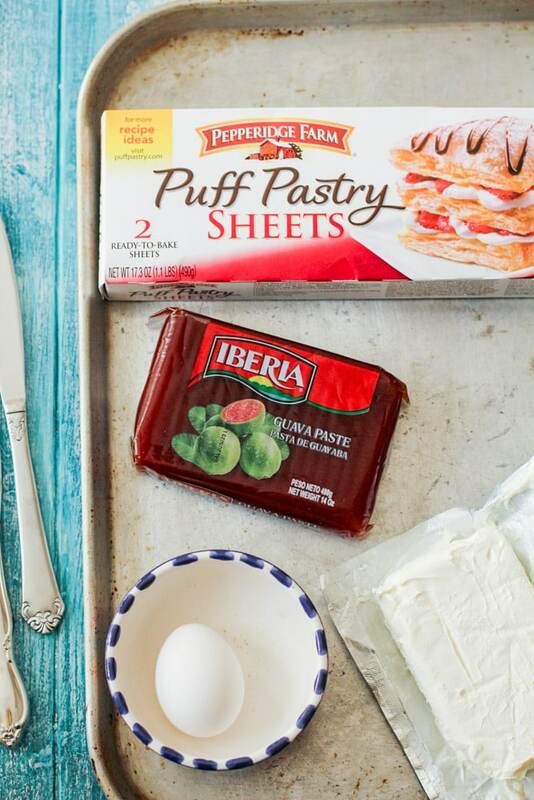 The puff pastry comes with two, you’ll be using both to make 9 pastelitos de guayaba. I highly recommend buying two boxes, they go fast. P.S… see those raspberries? I have an upcoming raspberry guava cream cheese pastelitos recipe I’ll be sharing with you too! So.Much.Goodness! Unroll the puff pastry. Quick tip, layer the pastries, once unrolled (papers removed). This way you can follow the lines to cut three strips, and the rotate the board (or pan) and cut three more lines to create 9 squares in total. Remove the top layer and set it to the side. 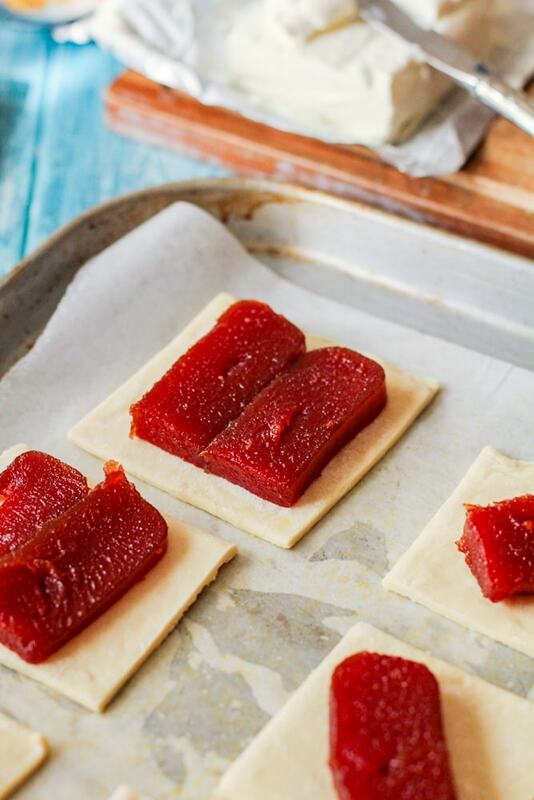 Now you’re going to add 1-2 thin layers of guava paste to the center of each square. Quick note, depending on your love level with guava, you may want to start with just 1 slice of guava. Some people find guava to be strong, I personally love my pastelitos de guayaba y queso to be filled with more queso. The beauty of this recipe is that YOU get to determine how much or little of an ingredient you will use. As far as measuring each “slice” you’re going to want to cut both the guava and cream cheese, in half width wise, and then cut 9 strips for a total of 18 small slices/chunks. Top the guava with a chunk or two of cream cheese. For the final steps, you’re going to take each remaining cut puff pastry and you can score the tops of the puff pastry (2-3 lines), this helps the puff pastries to create a vent and also, it looks really cool once baked. Then you’re going to top the guava and cream cheese with the matching puff pastry top. Brush it with the whisked egg. Do not skip this part! The egg yolk helps give it that beautiful golden hue. Believe me, for the second batch I tried cheating and using the remaining egg mixture, and it wasn’t as golden as the first batch. Don’t be like me haha. Crack the egg. Also, no need to crimp the edges, that’s optional, but not necessary. For a little more jazz since I was serving this at a party, I added raw sugar crystals on top. Super cute. Completely optional. Bake it at 400 degrees Fahrenheit for about 15 minutes. I was watching it like a hawk after 10 minutes. Cook until just golden and the edges slightly begin to crisp with a pinch of brown. 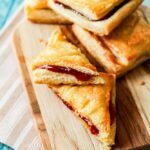 This Cuban pastelitos de guayaba y queso are a taste of my childhood and I hope you enjoy this simple classic treat. Tell me in the comments below, what is your favorite childhood treat? Do you still make it now as an adult? 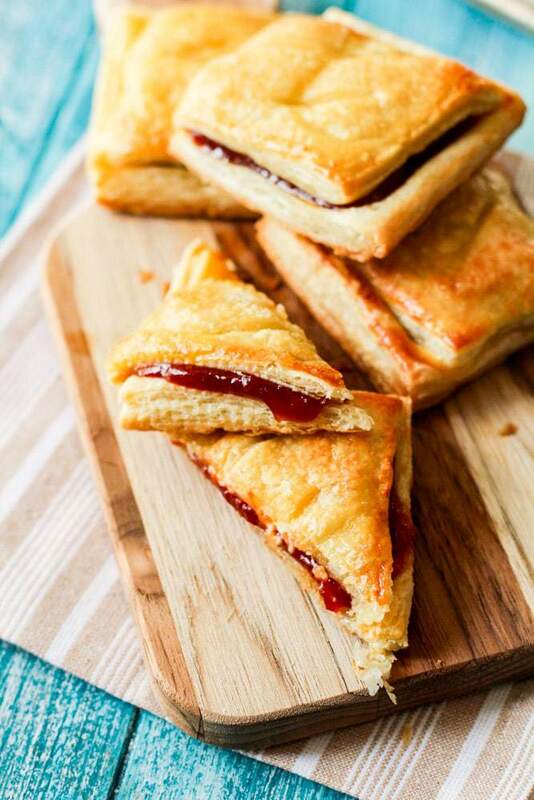 Flaky, sweet, and flavorful, these Cuban guava and cheese pastries are the perfect morning snack to perk up your morning with a side of coffee. Allow puff pastry to thaw for 15-20 minutes. 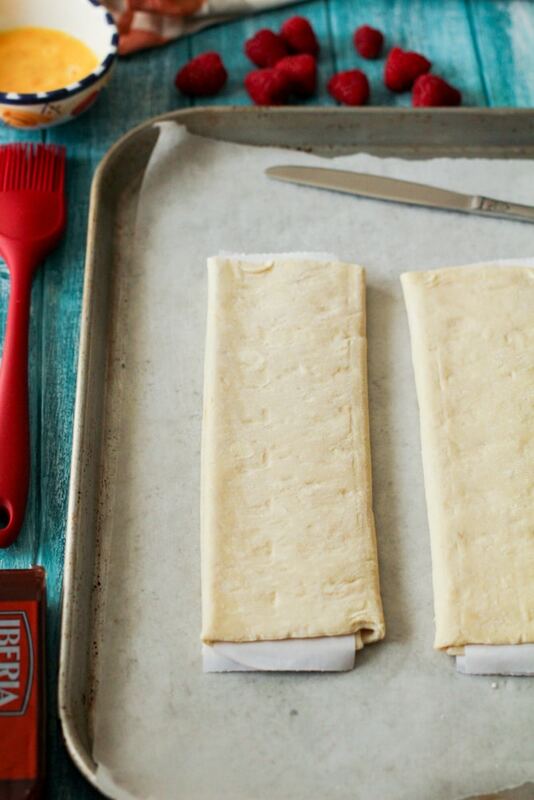 Unroll puff pastry, remove paper, and layer both over each other. Cut pastry into 3 by following the indented lines. Rotate the puff pastry and cut 3 additional lines to create 9 squares. Set the top layer of the puff pastry to the side. 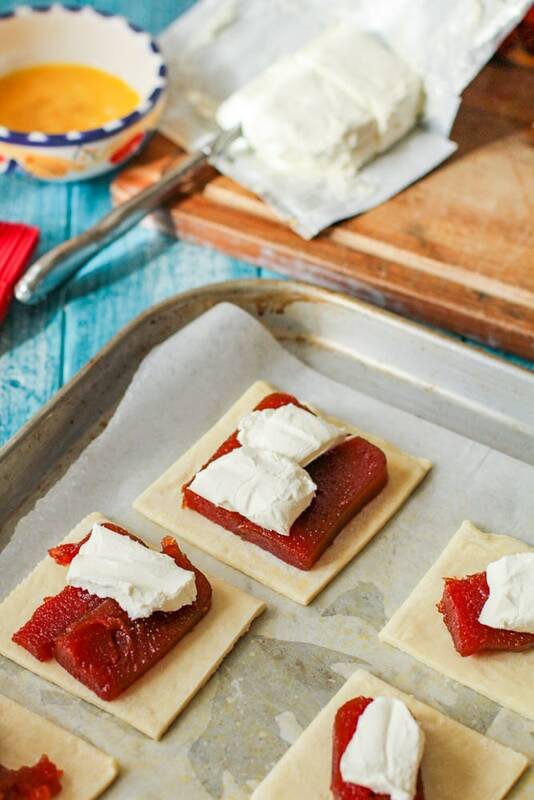 Add 1-2 slices of guava to each pastry (depending on your taste for guava), top with 1-2 chunks of cream cheese. Before returning the puffs to cover the guava and cream cheese, with the point of a knife, go ahead and add 2-3 slits to each square. Top the pastries with remaining squares. Brush the tops of the pastries with the whisked eggs. Bake for 15 minutes or until pastry tops are golden and the edges are the tiniest hint of brown. If desired, top egg wash with raw sugar or when the pastelitos de guayaba are baked dust with powdered sugar.